Setting their sights on the goal of creating a super productive autoflowering strain, FastBuds' team thought long and hard about the traits that their geneticist could select to attain maximum results - unprecedentedly high yield and powerful effect - to greatly exceed what is just "a good autoflower". They selected the best of the best - the FastBuds flagship strains: Chrystal METH and Mexican Airlines. But this was only the beginning. Many months of stabilization were spent enhancing the vigor and potency of this new strain while retaining the key features of the parent strains. The FastBuds' team is truly proud of their work and their hybrid fully lives up to its poppin' name - Six Shooter. Taste: Six Shooter - it's always fully loaded: attractive citrus-incense aroma with a smooth, fresh smoke that's complemented by notes of pepper, and in possession of such a strong effect that it will leave you disoriented in space and time. Effect: Each smokin' toke of Six Shooter hits the target dead center. Right after the first inhale you'll fly first class on Mexican Airlines to your own Chrystal Paradise. The effect is as sudden and profound as a barrage of explosive bullets fired by the quickest hand in the Wild West. Initially, the effect is precisely and totally in the head, then spreads to the body. Even if your tolerance is high, Six Shooter will strike you hard and unrelentingly with its unstoppable power. And don't forget its mind-blowing yield that is worthy of the best commercial grove. We can't say that its effect is mellow, so it's not suitable for use throughout the day. This weed is better for evening use. But don't worry, it won't leave you with a sensation of numbness or heaviness. 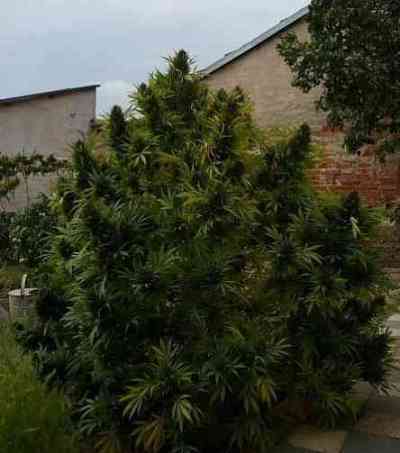 Growing: This strain is the largest, most massive, heaviest-yielding autoflower in the FastBuds' catalog. It reaches a height of approximately 100 to 140 cm (3.2 – 4.5 ft), exhibiting a beefy, elongated central cola surrounded by side colas of relatively more modest size. Also worth noting is the excellent, productive branch structure and shape in relation to the central stem and cola. Its bright green leaves are desirably sparse and have a rounded shape. The resulting high bud-to-leaf ratio makes the process of manicuring pleasantly fast. Flowering occurs 3 to 4 weeks after the emergence of the first true leaves. 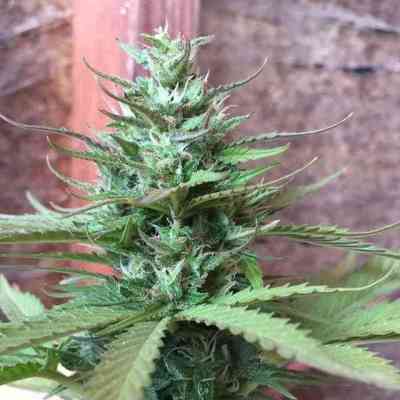 It is surprising that such a high-yielding autoflower is ready for harvest in just 9 weeks. Final yields reach a staggering 500 to 750 grams per square meter (up to 1.6 pounds per light). By the end of flowering you will understand why we chose the name Six Shooter. Its dense buds, reminiscent of large-caliber bullets and coated with a white powder of trichomes, sport a THC content of up to 21%! 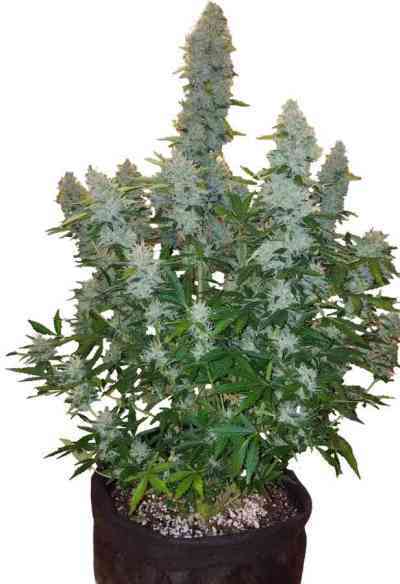 When grown outdoors, Six Shooter is notable for its speedy growth and outstanding production. This combo is of course the best option for a quick harvest. The adaptability of Six Shooter means that it also excels when grown indoors. Overall, Six Shooter won't stink up the barn. But that doesn't mean it ain't fragrant like the finest brothel. During mid-flowering a subtle citrus fragrance mingled with fine incense becomes apparent. The smoke has a soft, resinous herbal aroma.